Without a doubt, there is a lot to wade through when it comes to residential mortgage servicing. Federally, the CFPB has implemented a series of Dodd-Frank amendments to RESPA (Regulation X) and TILA (Regulation Z). At the state level, the Texas Department of Savings and Mortgage Lending monitors Texas-based residential mortgage servicers acting under the guidelines of the Texas Administrative Code. The founders of DIA Servicing understand that Texas owner-finance lenders did not go through the trouble to originate, document, and close the owner-finance loan correctly on the front-end, only to settle for subpar, non-compliant note servicing on the back-end during the life of the loan. As such, every action taken by our team now and forever in the future, will be guided by all applicable rules and regulations. We have a responsibility to both lenders and borrowers. To lenders, aside from efficient monthly payment servicing, we have a responsibility to protect their interest in the loan and to avoid jeopardizing the long-term returns. 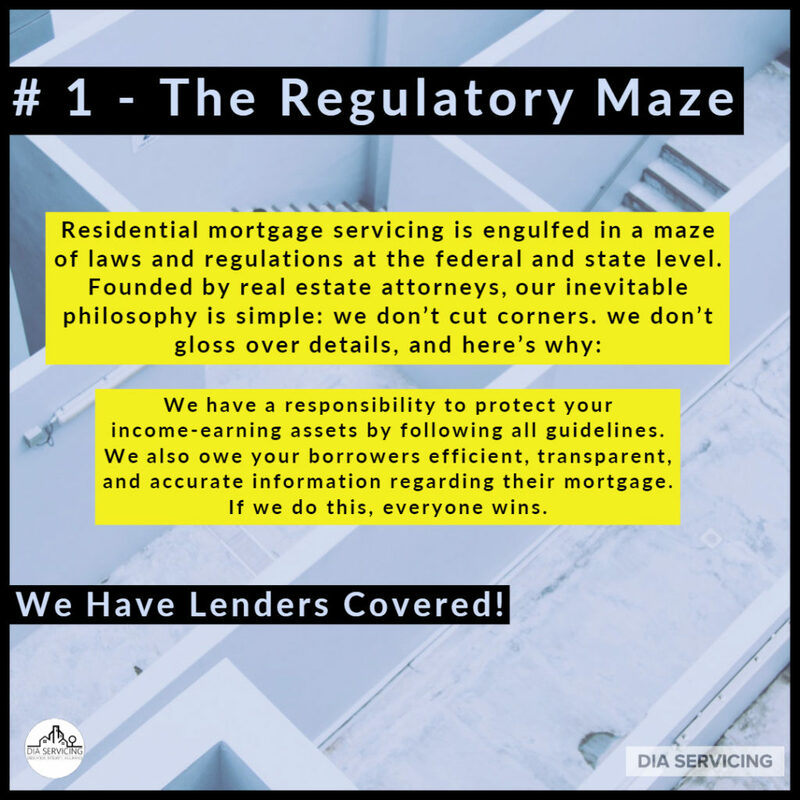 To borrowers, we have a responsibility to collect, report, and service their mortgage accurately, fairly, and in a way that all borrowers may understand the mortgage process better.